Fiction – paperback; Picador Australia; 276 pages; 2017. 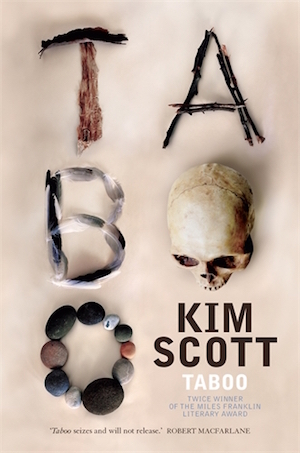 Kim Scott is a two-time winner of the Miles Franklin Literary Award and his latest novel, Taboo, has been shortlisted for this year’s prize. A descendant of the Noongar people of Western Australia, he is an indigenous writer whose work tends to focus on aboriginal identity and the sometimes strained relations between black and white Australians. Taboo is no exception. Set in Noongar country, it examines the thorny issue of reconciliation: after so much bloody and violent history, how can white Australians and indigenous Australians make their peace? Our hometown was a massacre place. People called it taboo. They said it is haunted and you will get sick if you go there. Others just bragged: we shot you and poisoned the waterholes so you never come back. Dan, a devout Christian, wants to pursue his late wife’s dream to invite the Noongar onto the farm, to “reconcile themselves to what happened here”. He is more dismissive, thinking it was a long time ago and “there was no real evidence of any more than a few Aborigines being killed”. It’s fair to say that this massacre haunts the pages of this novel; a ghostly spectre that reminds us that modern Australia is built on horrific foundations. The story is also haunted by the long arm of dispossession, and the devastating impact on people when their cultural identity has been stripped from them. In places it makes for depressing reading. Pretty much every indigenous character in this novel is struggling with an addiction, whether drugs or alcohol, and many have been in prison for violence and petty thievery. Tilly’s back story is particularly horrific. Raised by a white mother, when she’s a teenager she learns that her father is an Aborigine, the legendary Jim Coolman, who’s serving time in prison. Drawn into the orbit of her new family, Tilly falls prey to a (white) violent sexual predator who feeds her drugs, ties her to a leash and treats her like a dog. But there is hope here, too, for when Tilly eventually escapes she grabs a rare chance to make something of herself: she wins a scholarship to a boarding school, settles down to a life of some normality and is welcomed into the arms of her (extended) Aboriginal family. In his afterword, Scott describes Taboo as a “trippy, stumbling sort of genre-hop that I think features a trace of Fairy Tale, a touch of Gothic, a sufficiency of the ubiquitous Social Realism and perhaps a touch of Creation Story”. And he’s right: at times it does feel “trippy” and, I’d argue, slightly patchy and uneven in places. The second third of the novel feels a bit baggy and seems to lose direction after a solid, intriguing and page-turning first third. That said, this is by far Scott’s most accessible novel — the language is slightly pared back compared with the complex Benang, for instance — and it feels particularly modern and relevant. Despite the sometimes oppressive nature of the story, it brims with optimism. Scott is careful not to make this a revenge story — “Our people gave up on that Payback stuff a long time ago” — and instead chooses to focus on how it is possible for people to “claim back” their identity, largely through the use of the Noongar language (see Lisa’s review at ANZLitLovers for her excellent dissection of this issue). For another take on this novel, please see Bill’s review at The Australian Legend. This is my 3rd book for the Miles Franklin Literary Award 2018 and my 4th for #20booksofsummer. It also qualifies for ANZ LitLovers’ Indigenous Literature Week(July 8-15 2018). I bought this one from Readings.com.au last year because I suspected it would never be published here in the UK and, having read Scott’s earlier work, I wanted to read it as soon as I could. Alas… it took me eight months to get around to it. Re the ‘trippiness’ of the writing: yes, it can take away from its readability, but I think that raises an interesting issue that applies to all kinds of books. Scott says he did it deliberately, so it’s not a lack of skill: it’s an authorial choice to make a point about the fractured experience of being Aboriginal in Australia. (I am especially conscious of this right now because I’m reading Growing Up Aboriginal in Australia edited by Anita Heiss). So the issue is: when a writer takes a fractured approach of whatever kind and for whatever reason, it brings with it a risk that the reader will reject it as too hard to follow, misunderstand it as a deliberate choice, judge it as an author’s lack of skill or ascribe motives to it that are wrong. Or just not like it, which is always the reader’s prerogative. So the author, who thinks he has something important to communicate (or he wouldn’t be writing the book) risks alienating perhaps the very people he wants his message to reach. OTOH to write a straightforward narrative that is more accessible means not using one of the tools in the writer’s armoury. I am, as always, writing a novel in my head, and I am struggling with how best to tell it so this is an issue that’s relevant to me! Interesting to hear Scott’s “trippiness” is a planned device… it totally explains the unusual structure of That Deadman Dance, which I found difficult to follow, and Benang, although I loved that novel and “got” the fractured nature of the storyline. It works well, here, too, but I think it’s much less apparent than those two earlier novels… this one felt like a much more straightforward narrative, with just a few jumps backwards and forwards in time; it was more the pacing that felt uneven rather than anything else. Thanks for the link. Scott is one of my favourite authors though I must say I too found this novel ‘patchy’, and perhaps he won’t ever again reach the heights of Benang. I would also like to emphasize, particularly to your non Australian readers that the massacre underlying Taboo is real, Scott has been dealing with it ever since he was introduced to his father’s people. Ah yes, I should have pointed out it’s based on a real massacre — Scott talks about it in his afterword. I finished this book today so I’m still trying to pull my thoughts together. I agree that the storyline was patchy and there were a few too many co-incidences. However I felt a real connection with this novel – the descriptions of place were so well rendered as was the pull and healing nature of culture. I felt like I was given a secret insight into what it was like to be of Aboriginal decent and not many writers can do that! The magical realism bits took me off guard a bit but they didn’t detract from the story. I struggled with Doug’s character, though, and especially how he kept popping up.